All eyes will be on you in this lavish two piece Tiffany quinceanera gown 24035. 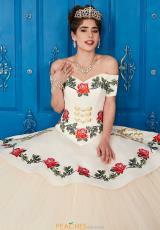 An off the shoulder sweetheart neckline features gorgeous floral applique and beadwork throughout a satin bodice. A corset back leads into a stunning tulle skirt. Shop more Tiffany quinceanera gowns at Peaches Boutique.